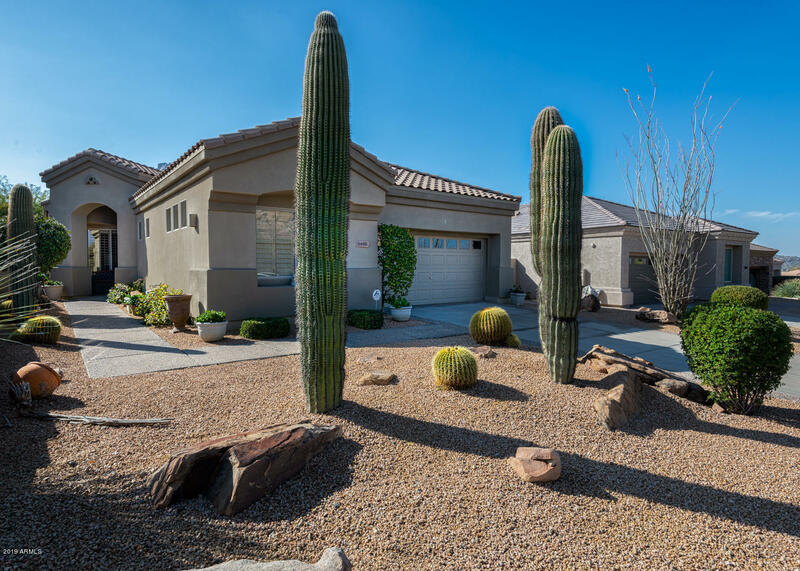 This popular Shea Home is located in a mountainside community within Troon Village. There's an aggregate sidewalk leading to the front door and the front entrance area is paved in Flagstone. There is a combination of tile floors and carpeting throughout home. Home is equipped with alarm system, GE Profile appliances, gas fireplace in the living room, bathrooms have tumbled marble countertops and floors. Door in the living room opens to a resort style backyard. The front, side and back yard landscaping is meticulous. The south facing backyard is complete with a Flagstone patio, heated spa and pebble-tec pool, rock waterfall and a breathtaking unobstructed view of Troon Mountain. Lush desert vegetation and boulder outcroppings abound. Natural Area Open Space in front and behind home!